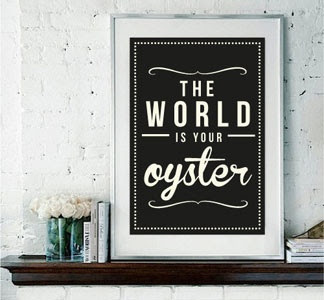 Everything Coastal....: The World is Your Oyster! I treasure my found "pearls" every single day... love, a sunrise, summer wildflowers, beach walks, shells in my pockets, a good book, new music, good wine (I do live in California! ), a new recipe to try, discovering an art gallery, exploring an antique store - the list goes on. My life has always been about peeking inside the rough, bumpy shell to find the pearls that I might miss if I didn't slow down once in a while. Amazing how much happier I am when I remember to just enjoy those simple things. 1. My funny, loving children. 4. Friends. My life is so incredibly blessed to be touched by such a rich circle of incredibly talented, funny, interesting and smart, wise people that I am lucky enough to call friends. Have a great weekend, and remember to relish your pearls too. How very true... beauty is all around us - we just have to take the time to find it. There are plenty of pearls to go around.